The YT-1300 is a legendary starship, best known for its association with the professional gambler Lando Calrissian, and later with the smugglers Han Solo and Chewbacca the Wookiee, who respectively made numerous modifications to transform their YT-1300 light freighter, the Millennium Falcon, into one of the fastest ships in the galaxy. 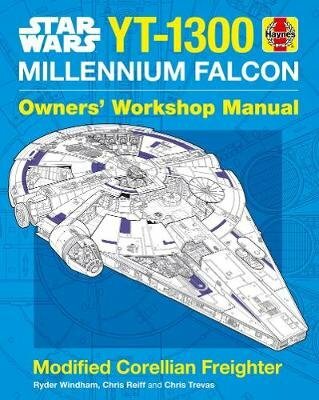 The YT-1300 Millennium Falcon Owners' Workshop Manual traces the history of the Corellian Engineering Corporation's YT series of starships, and the development of the YT-1300 model line before focusing on the Millennium Falcon. The vessel's evolution - from common freighter to luxurious pleasure craft to battered warship - is described in detail and illustrated by numerous photographs, line art, floor plans, exploded diagrams, and stunning computer-generated artwork by renowned Falcon experts Chris Reiff and Chris Trevas. Text is by Ryder Windham, author and co-author of more than 70 Star Wars books. This Haynes Manual, which includes details of the Millennium Falcon appearing in the original Star Wars trilogy, plus The Force Awakens, The Last Jedi and Solo: A Star Wars Story, is the most thorough technical guide to the Millennium Falcon available, and is fully authorised and approved by Lucasfilm.